Residents of South Carolina’s Lowcountry witnessed an unusual natural light show on Sunday August 16th. 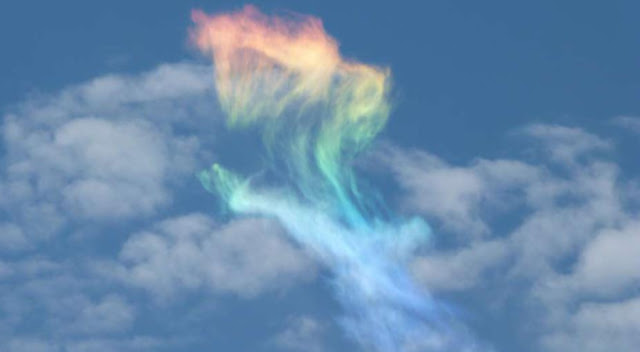 A “fire rainbow” appeared in the sky and drew comparisons to “a multi-colored angel” for about an hour before disappearing, The media in Charleston reported. Images of the iridescent clouds went viral, but scientists say “fire rainbow” is a misnomer: the phenomenon is not a true rainbow, and it has nothing to do with fire – instead of rain or flame, the phenomenon is caused by ice. Perhaps the most memorable time a “rainbow” – real or false – went viral was in 2010, when a YouTube video of a “double rainbow” spotted near Yosemite National Park was posted online.